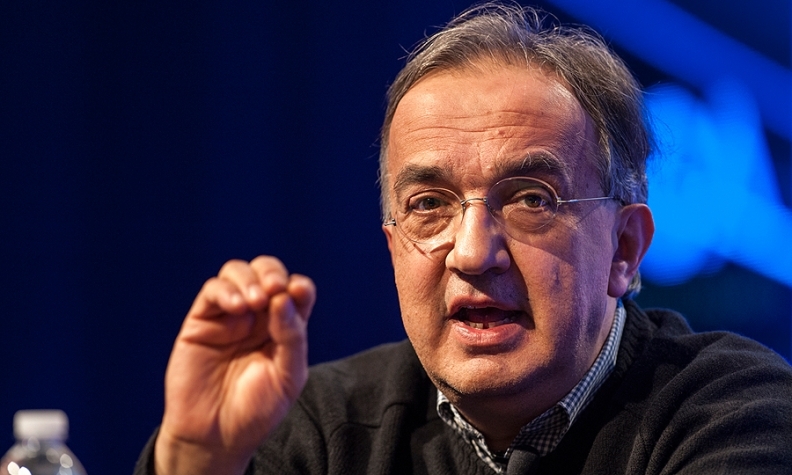 Sergio Marchionne's stake in Fiat Chrysler is valued at $203 million. DETROIT (Reuters) -- Fiat Chrysler Automobiles CEO Sergio Marchionne earned a pay package currently valued at 31.3 million euros ($34 million) last year, including a bonus for cementing a deal that created the world's seventh-largest carmaker, a regulatory filing showed. Marchionne received a salary of 2.5 million euros, annual incentives of 4 million euros plus other compensation to bring his pay package to about 6.6 million euros, FCA said in a filing with U.S. regulators. In addition, non-executive directors approved a one-off cash award of 24.7 million euros to recognize his strategic contribution to the group last year. As part of the extraordinary incentives, Marchionne will also receive a grant of 1.6 million restricted shares, subject to approval by shareholders, and a special bonus of 12 million euros that he will receive only when his mandate ends. Marchionne has said he will stay at the helm of FCA through the end of a five-year plan ending in 2018 that includes expansion of the Jeep and Alfa Romeo brands. The 62-year-old, who also serves as chairman of luxury unit Ferrari and CEO of FCA's North American operations, is credited with engineering the combining of Fiat and Chrysler into a single company last year, and moving the primary listing of the merged FCA to Wall Street in October. This year he is planning to spin off Ferrari from the group and sell at least 10 percent of the unit in an initial public offering. The stock rose 85 percent since the Ferrari spinoff and IPO were announced at the end of October. Marchionne's plans for FCA are to invest 48 billion euros over five years to 2018 to turn Jeep, Maserati and Alfa Romeo into global brands that will allow FCA to rival Volkswagen and BMW by strengthening its position in the fast-growing and high-margin market for premium cars. Marchionne already owns about 14.4 million common shares in FCA, valued at a total of 203.3 million euros at Thursday's closing price for FCA shares traded in Milan. As of Thursday's filing with the U.S. Securities and Exchange Commission, that accounted for 1.12 percent of FCA's outstanding common shares. Including loyalty shares, Marchionne has a 0.85 percent voting stake, according to Reuters calculations. Marchionne's base pay and incentives in 2013 totaled 3.6 million euros.